Click on the headphone button to use RoboVox in real-time with headphones. Click on the parrot button to use the parrot mode: Speak into the microphone of your phone and the app will repeat what you said with a transformed voice. Press the record button and record your voice and press play to play back your voice transformed. 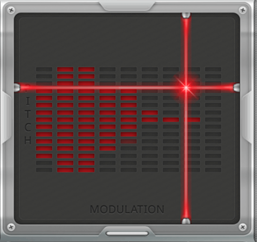 Use the X-Y Control Field to modify the pitch and modulation of the selected voice model. The x-axis controls the modulation and with the y-axis you can change the pitch. Choose among 32 voice models such as Pitch Shift (Chipmunk, Helium voice), Discobot, Badman, Exorcist, Bionic, Croack, Singing Robot, Dark, HAL, Stephen, Prophet. Switch between the banks with a swipe gesture to the left or right.